It’s amazing what a little bit of stock market turbulence can do. I mean that in a bad way. As of this writing, both the S&P 500 and the Dow Jones Industrial Average are down around 7% from their recent highs, which brings them back to their… early December 2017 values. While financial markets are worth keeping an eye on, daily fluctuations are not. This is particularly true when there has been no real event or data release to reasonably justify such fluctuations. I like this Tim Duy chart that helps put the current market in context with past cycles. The key point is that equity markets continue to increase even during a Fed tightening cycle (rising interest rates). The current market looks to have accelerated some in recent months, relative to these past cycles, and then seen a moderate correction. 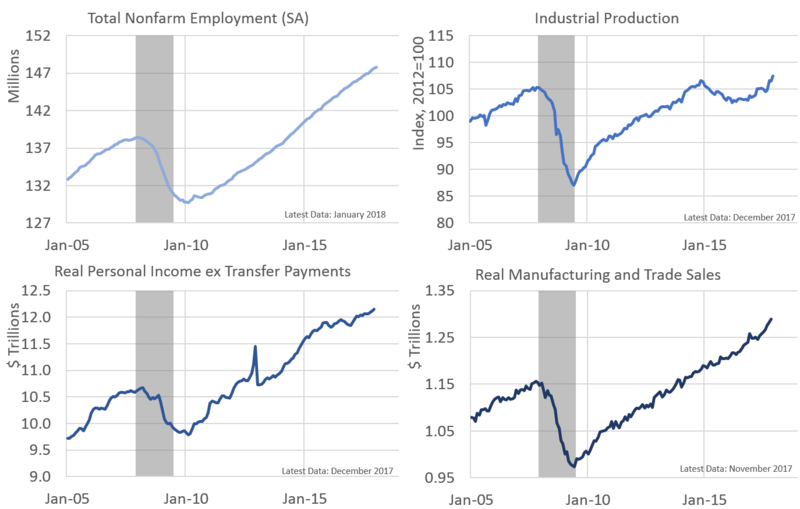 The bigger point here is that the economic data flow continues to be healthy. The charts below show the four main indicators that the National Bureau of Economic Research (NBER) uses to date U.S. business cycles. As of the latest available data, the U.S. is clearly not in a recession yet. Furthermore, if somehow it were in recession, it would take massive data revisions to reveal that the top of the cycle was December or January. Now, even as expansions don’t die of old age, we know another recession will come eventually. It may even be sooner than many people think. However, as of now the economy is still expanding, and all of the leading indicators are flashing green. That said, the U.S. economy is entering into a different phase of the business cycle. It is or will soon be running up against supply side constraints, which will impact net growth rates moving forward. After a few years of autopilot, the macroeconomic outlook is interesting again. And I largely mean that in a bad way too. It’s not particularly concerning today, just a bit of nervousness as we try to gauge when the economy moves beyond a mature cycle and into the late stages of the business cycle.